Door Size (W x H): 3,5 x 3,5 m.
Box dimensions: Box 1: 65.0 x 70.0 x 100.0 cm. Box 2-3: 73.0 x 50.0 x 291.0 cm. This great shelter contains multiple purposes for storage. It is ideal for agriculture or industrial projects, both short and long –term projects. 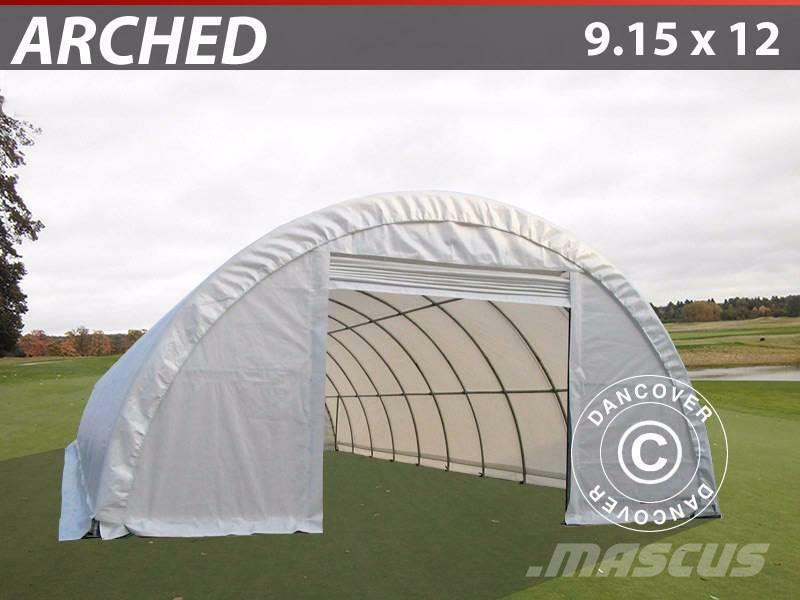 It gives you the convenience, ease, and durability you are looking for in an industrial shelter. The shelter is spacious and designed for storage for everything from machinery to cars and construction materials. The possibilities are countless. The 2 gates make it easy to store, restore and use what is stored in the shelter. This is a robust and solid construction! The heavy duty steel tubes are bolted together and stabilised with heavy purlins. Furthermore, there are cross stabilisers for maximum strength in windy weather. The foot plates can be mounted and secured into the ground or other surfaces as concrete or wooden frame. The tarpaulin is easy to clean and needs very low maintenance. This tarpaulin will effectively provide long life protection, of your vehicles and equipment, from the weather.